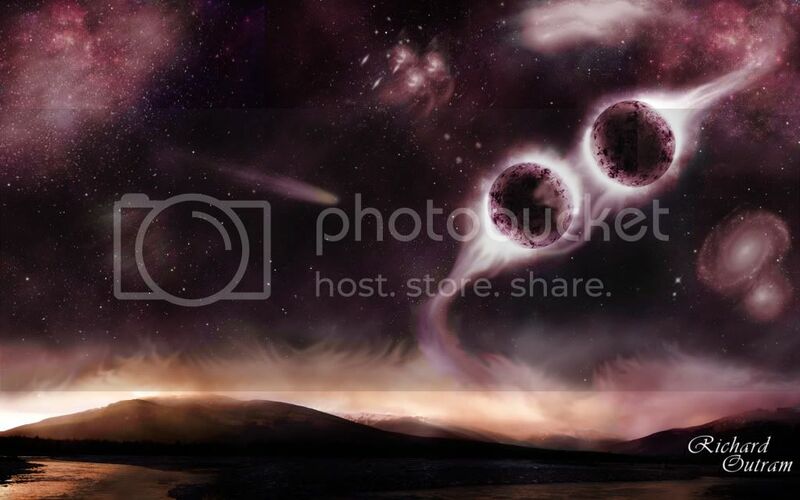 In this tutorial I will show you a simple way to create a fantasy photo manipulation with two planets almost colliding. This tutorial needs intermediate Photoshop skills. I will show you useful things like how to create a galaxy effect using stars, nebula, light brushes. You will also learn how to shape and texture a planet and much more. I hope you like it so Let's start! Before we begin you have to download the stock images and resources that we are going to use in this tutorial. Create a new psd file. Because I intend to make an wallpaper from this image I will create a new file with the size 1920x1200px. This is actually one of the wallpaper's standard sizes. Copy the Stars Field Stock Image and call this layer Stars Layer. This is our initial scene. First copy the Landscape Stock Image into your file. Resize it to 50% to fit into place. Press Ctrl+T again this time lock the width, because we will change only the height to 70% (vertical scale). You can see that there is an unpleasant area where the Star Layer and the Landscape Layer meet. So to fix that, add a Layer Mask to the Landscape layer. There is a little button on the Layers Tab. With a Soft Round Brush, color black, opacity 80% paint over the area that you want to blend. You can see the image before and after adding the layer mask. We will change this layer in the next steps while the other elements are added. copy the Galaxy Nebula Stock Images into another layer called Nebula Layer. Resize it to 50% and duplicate it. Place the 2 nebula layers as shown in the image. Change the blending mode from Normal to Lighten, opacity 50%. With a round size brush, use the eraser tool to fix the little blending problems. Before going further with the lighting, colors and other adjustments I want to add two planets that are almost colising. Create a new layer, called Planet Texture. Copy the planet texture stock image and resize it to 50%. With the Eliptical Marquee Tool selected, press Shift to draw a circle selection. Select Inverse and remove to have only the circle. Press Ctrl and click the Thumbnail of the Planet Texture Layer. As a result you can see that the planet is selected. Go to Filter - Distort - Spherize and set the amount to 100%, mode normal. Go to Brightness and Contrast and do the following settings. Reducing the contrast and the brightness, the planet will blend in better wth the rest of the image. Select the Planet shape. Create another layer and fill the selection with white. Call this layer the Highlight Layer. Move the selection like in the image and press delete. Now Duplicate this layer and press Ctrl+T to flip it. The settings are W:-100% and H:-100%. Now place it like in the image. Merge the two Highlight Layers. Select the center of the Highlight Layer and create a new layer. Fill the selection with black color. Call this layer Shadow Layer. Add Gaussian Blur, setting radius 42 px, to the Highlight and Shadow Layer. Change the Blending Mode of both layers to Overlay 100% and Overlay 80%. You can see a small change. Now i have duplicated the Highlight Layer to obtain a better contrast. With the same technique create and play with multiple Highlight Layers but this time use smaller sizes. You can see in the image where I will add light sources. There will be 2 light sources coming from oposite sides. Duplicate all the Planet Layers and put them into one group called Planet Group. Keep the initial layers into another group and hide it! It is always best to keep a copy of every step you never know when something will go wrong! Resize the Planet Group to 40%. Now i will add light effects, stars and other galaxy elements. For that you need to load the three sets of brushes presented in the first step. Now with the Eraser Tool, round brush, size 100px gently eraser the edges to blend in the Planet light layer with the rest of the image. With the technique presented in the previous step, add another Highlight Layer to adjust the luminosity of the planet with the new added light. 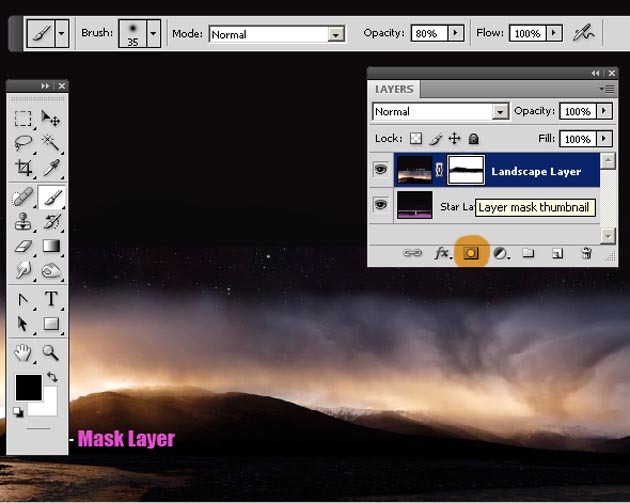 Create another layer above all the others, called Light Edge Layer. Take the Brush Tool, round shape, size 20px, color white and simply draw lines around the edges. Use the Blur Tool and eraser Tool to make the light diffuse and real. Select all the planet layers and the light layers and put them in a group called Planet+Light Group. Duplicate this group. Move the group copy up and rotate it with 180 degrees. It is time to return to the Landscape Layer and adjust the image. Use the Eraser Tool to delete some areas and to obtain only a focal light area. Use a 100 px round brush, opacity 60%. I have used my graphic tablet to obtain a better result but it can be dome with the mouse also. Return to the Planet Light Layers (remember that we have two planets) and use also the Smudge Tool to adjust the light trails like in the image. It is up to your imagination, you can give whatever shape you like. In this last step i will add another space elements and adjusting the colors. Create another layer, call it Comet Layer. Lets use the other sets of brushes. So use Galaxy Brushes and Comet Brushes to add elements on the sky. Use color white, different sizes and opacities. The rule is: if the object is in front is bigger and with higher opacity and if the object is in the back use lower opacity and smaller size. For the final adjustments we have to create three layers called: Light Accents, Clouds and Color Layer. So lets start by creating a new layer above all the others, called Light Accents. With a soft round brush, color white, paint the areas where you want a lighter tone. Change the blending mode of this layer to Soft Light 40%. The second layer, Clouds layer. Set the foreground color white and background color black. Fill the layer with white color. Go to Filters - Render - Clouds. Go to Filters - Blur - Motion Blur and set the angle 40 and distance 35. Set the blending mode of the layer to Soft Light 70%. For the third layer, Color Layer, use the Brush Tool, round, 200px size to paint over almost the the entire image. The reason we do that is because we want that the planet, planet lights, stars, glaxy elements to have a similar color mixture. So the colors I have chosen are orange #ea4300, red pink #eb0022 and purple #a24c5c. Set the blending mode of the layer to Color 20%. This way you can paint and see the result in real time. Here is the final result for this planets colliding photo manipulation; you can check out other amazing space galaxy planets Photoshop tutorials that will inspre you for sure. 26 comment(s) for "Planets Colliding in Our Galaxy Photoshop Tutorial"
I really don't understand Ibrahim, you want me to explain more detailed how the Tools work? usually I don't approve comments from people that input a fake email. Thank you for posting your comment, but I disagree with it. I am so happy that you like my tutorials. I am really glad you like my website and my tutorials and, thank you! Regarding to video tutorials, I am afraid my spoken english is not that good so I can't make video tutorials. I am really trying to create complex tutorials that are explained step by step. Here is a link to my photo manipulation tutorials, but I don't really know what tutorial to suggest you .... choose one and tell me exactly what step you can't make! Hello , i like your website, i know how hard it is to make such an awesome website and to maintain it. My art teacher told me to do something of my own in photoshop and print it and show her and tell how i did it, so i have chosen your tutorial. the problem is that i cant understand how you do each step. it would be great if you start making videos on your next tutorials so that every one can understand it easily. pls reply me with the link to to your great tutorials which are more easy.